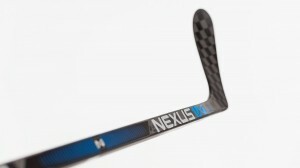 Bauer Nexus 1N Hitting Stores SOON! Imagine a hockey stick that promises to put the puck exactly where you want it. Sound too good to be true? Well that’s exactly what the Bauer Nexus 1N Composite stick promises to do. Ok, that’s not exactly true, but thanks to their advanced and reengineered technology, it makes it a lot easier to do and provides a much more consistent and accurate shot. The stick officially launches and arrives in Hockey World stores 9/12/15, but you can pre-order yours today and be one of the first to try out this technologically advanced hockey stick. With this new Bauer Nexus 1N Composite Hockey Stick, Bauer wants to help you set your sights. This hockey stick features the Nexus Sweet Spot Technology – a technology where Bauer has re-engineered the use of Carbon Fiber within the stick’s structure to allow for an easier and smoother transfer of energy during your shot. This smoother transfer is maximized during mid-motion wrist shots as well as slap shots, and helps you get off a more accurate shot each time. But how does it help provide a more accurate and consistent shot? Simply put, thanks to the Sweet Spot Technology, the stick is more easily loaded than previous sticks and reacts to your hand position to help you hit your target on a more consistent basis. Consistency is just one of the many, as well as most important skills to being a great hockey player. In more technical terms: Nexus TRU Mid-Kick flex Profile with Sweet Spot Technology uses eLASTech Technology, which is Bauer’s Proprietary resin system that uses carbon nanotube reinforcements. The Lightweight TexTreme© construction uses a MonoComp Technology with a POWERSENSE 2 Blade Core which uses the next evolution of SENSE Technology – the overall blade weight is drastically reduced and balance is improved. The stick’s Pure Shot Blade Profile adds durability and strength with double concave walls and a Power Profile using dual taper. The Matte Blade with Texture contains a sweet spot to assist with quick motion shots. The stick is $269.99, comes in a variation of flex (102, 87, 77) as well as the option of two pattern lie colors. Don’t forget, you can check out the stick launching throughout Hockey World stores September 12th or beat the masses and pre-order yours today. If purchased online, you’ll get free shipping (for that and any other orders over $99).